Come at John Travolta and he's liable to get a little pushy. We learn this about his character Ben Aronoff in our exclusive clip from Speed Kills, which hits theaters on November 16. John Travolta is a champion speedboat racer turned multimillionaire in Speed Kills. He's caught leading a double life, which lands him in trouble with the law, as drug lords come gunning for him. 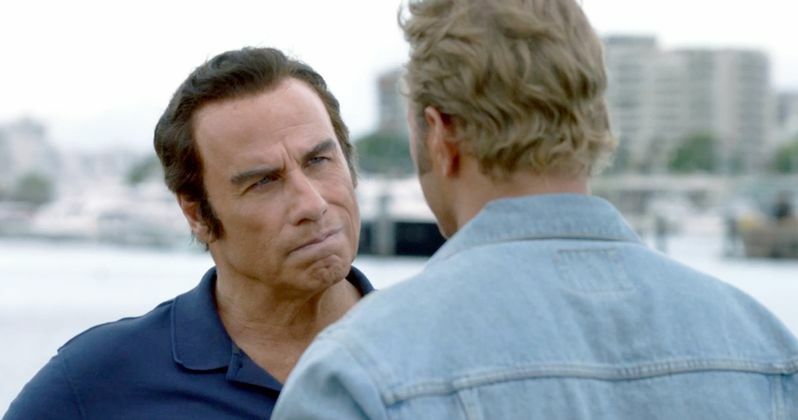 In our exclusive sneak peek at this exciting release, we see Travolta's Aronoff at the marina. He is confronted by a thug who wants a couple of bullet holes fixed in his boat. Aronoff doesn't have the time or patience for this guy, asking him if he knows how to swim before shoving him off the pier and into the water. It's good old fashion badass John Travolta like we remember him in so many classics. John Travolta stars in Speed Kills alongside Katheryn Winnick, Jennifer Esposito, Michael Weston, Jordi Mollà, Amaury Nolasco, Matthew Modine, James Remar and Kellan Lutz. The movie is directed by Jodi Scurfield from a script written by David Aaron Cohen & John Luessenhop. The story and characters are based on a book by Arthur J. Harris. Speed Kills is based on the true story of Don Aronow, a legendary powerboat racer and manufacturer who had alleged deep ties to the mob. He was later murdered in broad daylight on a street he helped build. The movie brings the man's story to life with some changes. Production kicked off in June 2017, with the shoot taking place in San Juan, Puerto Rico. With its accessible beaches and art deco architecture, Puerto Rico was the ideal location to double for Miami Beach. And we get to see this backdrop used gloriously in our exclusive clip. Speed Kills alters the historic events surrounding Don Aronow's interesting life and tragic death. Some actual individuals are represented in the movie, but most of the characters have been changed, are an amalgamation or otherwise fictionalized. Jonh Travolta was the only choice to play Ben Aronoff, and he quickly agreed to signing on for the drama. Katheryn Winnick was also their first choice to play Emily Gowen, Aronoff's second wife, and luckily she said yes to the juicy role. The movie takes place over three distinct time periods. And the shoot was long and arduous, but the finished project looks pretty enthralling. Acclaimed Toronto based DJ Miss Tara wrote the original song Speed Kills for the soundtrack, with Columbian singer Jaycob Duque stepping in to provide vocals. The catchy song gives the finished movie a very Latin-infused vibe with its infectious summertime beats. The song has already gone onto win the Akademia Music Award for Best Latin Song in advance of the film's upcoming release. if you love Speed Kills when you see it, know that the filmmakers have also collaborated with Top Dog VR to create a virtual reality companion piece to the crime thriller. The Speed Kills VR Cinematic Experience immerses viewers in the world of the film through the use of drones and cameras strapped to speed boats. Fans will get to experience the events of Speed Kills alongside the characters. It has already been called a game changer for cinematic VR experiences. You can also discover some of the movie's feel and tone in our exclusive clip featuring John Travolta. Be sure to check out the movie in theaters this month. It will also get a simultaneous release on VOD.